"Love" token, awarded by Amire80. This is also applies to other projects in the Bashkir language. Thanks. T174643: Fix sort order in Bashkir projects' Special:AllPages, etc. I agree this must be done, and should also be submitted upstream to CLDR. Should Й be between И and К? 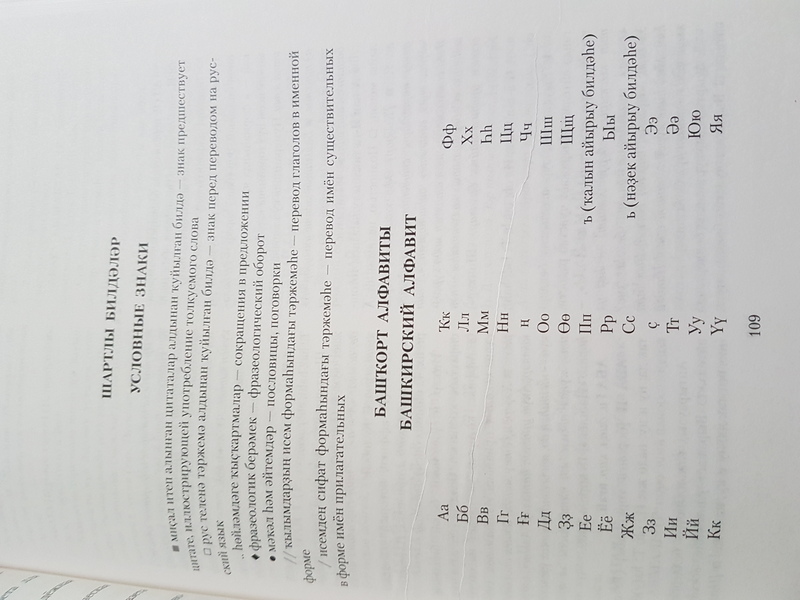 Ъ, Ы, and Ь are not mentioned at all. Judging by the image in the dictionary and by Wikipedia articles such as Ыҡ, Ы can even appear in the beginning of the word. I guess they should be between Щ and Э. Again, just checking. Amire80, thanks for your comment and your attention. “1. Й - Yes, it should, because some names beginning from the letter Й. Eventually this should be in ICU. But how does it get there? If I submit this as a ticket to CLDR, will it eventually get also to ICU? Until it gets into ICU, can we change it locally in MediaWiki? I couldn't find the answers in mediawiki.org. It should be documented in https://www.mediawiki.org/wiki/Localisation . I'm not really that familiar with how the process works. I only worked on implementing MediaWiki support for languages that were already supported by ICU. Looking at commenters on a similar task T48235: Kurdish Wikipedia: Alphabetical order in the categories (collation), @Bawolff or @kaldari might be able to help. We can't easily add collations unsupported by ICU in MediaWiki. The best thing we could do is to use a collation for a similar language instead, if the alphabet is close enough. As far as I remember, there was a problem with sorting of the letter Ё in Russian Wikipedia, but it was a long time ago and I don't know how this problem was fixed. Yes, getting it into cldr is the first step. Be prepared for this being a super-long time before the change gets to wikimedia. We can try to hack something together in the meantime for mediawiki (unfortunately php bindings to libicu dont support tailoring, so the most easiest way ofdoing that is impossible, but we can still replace letters and things). Tips to get a locale added to CLDR are available at https://translatewiki.net/wiki/CLDR . Now that we've written the workaround, we need a configuration change to set $wgCategoryCollation = 'uppercase-ba' for the Bashkir Wikipedia, and confirmation from the community that it behaves like they expect. Thanks to @Bawolff for making this. It appears to work well, and it might become the pioneering solution that may be applied to more languages. Selecting next 100 rows... processing...0 done. Mmmm... is there anything left to do? Does it have to remain open? Why wasn't it completely done the first time? The cl_from entries in those pages are missing (i.e. no page table entry) e.g. https://ba.wikipedia.org/w/index.php?curid=122102&uselang=en gives a badtitle error. That is from the production database. Since the pages no more exist (thank you for the check), I guess they are just artifact entry and we don(t have any system to garbage collect them.